The Two Roots CSA is a special chance to be intimately connected with our farm, your food, and your diet. Our CSA members get the best of what we grow. CSA (Community Supported Agriculture) members receive fresh local produce every week of the growing season by buying a share in our harvest upfront. To us at Two Roots, it means much more than a subscriptions service however. We see purchasing a share in a sustainable farm as a commitment to help work for a healthier food system, community, and earth. There is power in knowing where your food comes from- we promise to grow fresh food that is good for people and the planet. Let us be your farmers— join our community, and eat the best. Several options for CSA membership exist, you can explore them below. All members become part of our community. You will receive weekly emails and an invitation to our online social community where we share recipe ideas, vegetable information, and farm updates. Also included in each membership is tickets to our spring farm picnic and end of season harvest celebration! Members who choose to pick up at the farm are able to pick out the produce they want from the farm stand and do occasional U-Pick crops in the field. 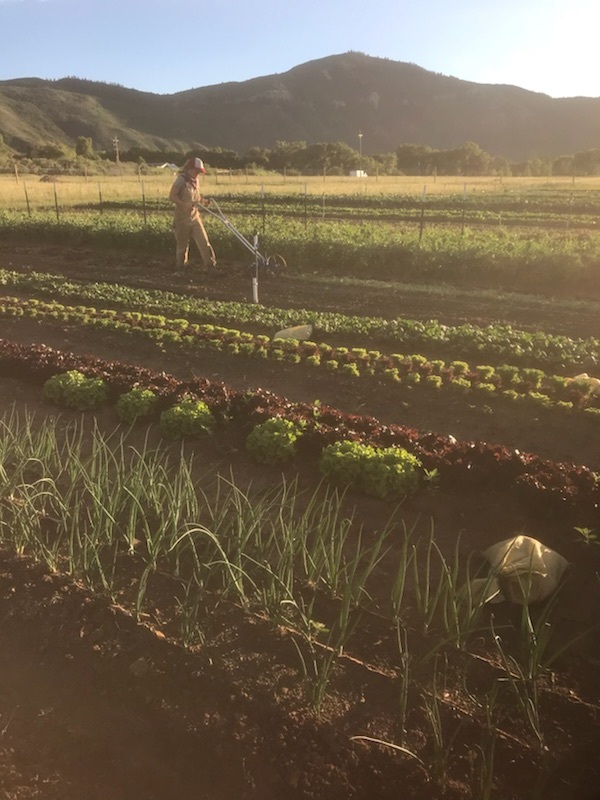 Pick up will be on the farm every Thursday from 3-7:30pm at our farm in Emma (100 Sopris Creek Rd, Basalt). If you are interested in joining a community of neighbors who eat with the seasons, value organic local produce and who care about how their food is grown—than you have stumbled on the perfect place. Because our members commit upfront to eating our food for the season, our CSA members come first on the farm. Our CSA community will always get the freshest and tastiest we have to offer as well as CSA exclusive events, weekly emails and videos filled with updates and information about that week’s harvest. We started farming out of a desire to change the way food is grown and sold. We think people deserve to know what is in their food and what is involved in getting it to them. Eating locally and seasonally does not come with the same guarantees and comfort that the average grocery store can offer, but to us the rewards outweigh the shortcomings. Part of the decision to join a CSA is a decision about what you value and the community you want to live in. The CSA is not just a chance to get a weekly bounty of the freshest produce possible, but to reconnect with your food and the people who grow it. By joining our CSA you support our farm’s mission to grow organic food without the use of chemicals, under healthy conditions that provide a fair living for the farmers while building soil and encouraging life. We are aware that joining a CSA program is not a good fit for everyone. You will need to be ready to cook meals, experiment with new vegetables, and form new habits. Our CSA members don’t join because they are searching for the cheapest organic produce or the most convenient option. We are not trying to compete with the grocery store, we are offering something incredibly different. We recommend you take time to consider if a CSA share works for you, and, if not, don’t worry! You can always find our produce at the Aspen Saturday Market or at Skips Market in Basalt. If you are ready to make the CSA part of your life, we are so excited to have you! We would love to be your farmers! What does a weekly CSA share look like? Each week there will be 8-12 crops to choose from. The produce offered will change with the seasons, whatever is best and tastiest at the time. Each week will include around 8-12 items. Because we offer a variety and choice at our pick ups, you are able to get the right amount of produce for your household size. The home delivery box will be enough produce for 3-5 people or 1-2 super veggie lovers. As a general guideline, we aim to include salad greens, herbs, cooking greens, root vegetables, a fresh snack item (peas, carrots, peppers etc), and an allium (onion, garlic, scallions etc) in every share.